This post is recently updated including the latest guidelines for creating WordPress Child theme. Many of us want to customize something in theme. Are you also looking to add or edit something in the theme that you are using? If yes, then you have come to the right place, my friend. This post is a simple and comprehensive tutorial on creating a WordPress child theme. If the theme has lots of customization options then this might help fulfill your needs. But regardless of how many options may be available, there can still be something that the current theme you have is unable to do or is not the way you like. So, if you are comfortable with codes and WordPress then you may dive into the theme files and start editing it spending some minutes, hours to add the changes that you like into the theme, only to discover you have lost those changes when your theme’s next update rolls around. So to avoid this comes our hero called the Child Theme. Creating a child theme allows you to make changes to your site without changing anything in the original theme’s code. Even if you’re only making a few minor tweaks, it pays to spend a few minutes creating a child theme. Note: To make simple CSS changes in your website, you can use Additional CSS box added in WordPress 4.7 instead of creating a child Theme. These changes made via Additional CSS box will still remain there even if you update the theme. But if you are looking for other additional changes like editing PHP files, a child theme must be created. So, I think this will cover the ‘Why Create a Child Theme?’ question. So, let’s move ahead and create a child theme. In this tutorial, we’re going to show how to create a child theme for our own popular theme Spacious. Create a new folder in your themes directory. You can do so using the cPanel or via FTP. The themes directory is the wp-content/themes. So, let’s name the folder as spacious-child. You can name it whatever you like but remember there should not be any space in the folder name. It is a common approach to name child theme as the parent theme plus -child added on the end. Inside the spacious-child folder create a file called style.css and fill in the information as shown below. Add this and save the file. Template name (here in this case spacious) should match the folder name of the parent theme and also make sure there is no blank space after the name. Other details can be added or changed as you like. Create a file called functions.php as you created ‘style.css’ in Step Two. And fill in the information as shown below. * Child theme functions file. // Parent theme style handle 'spacious_style'. // Enqueue parent and child theme style.css. In creating a child theme, style.css and functions.php files are mandatory while template files, and other files are optional and can be created if required. Lastly, to activate the child theme, in the dashboard go to Appearance->Themes. Look for the child theme you created and activate it. That’s it. Also, make sure the parent theme is also present in the installed themes for the child theme to work. If you now visit your site, it should look all same just like when the parent theme was activated. However, you may need to reset some of the settings in the Customizer. Only for ThemeGrill Theme Users, below we have provided child theme zip file for all our free and premium themes. You can download it and take it as the starting point to make your child theme. View all of our FREE and Premium WordPress Themes.You may also like to see this: The Best FREE WordPress Themes you must watch in 2017 . If you want to modify the theme’s CSS, you can add CSS in the end of the style.css file and save it. These CSS lines will overwrite the parent theme CSS. For example, say we want to change the font size of the site title for the spacious theme for 36px default value to 42px and also change its color from #444444 default to blue (#0000FF). Then you can just add the below CSS lines. You can also make structural changes to the theme files by adjusting template files. Say, you want some changes or want to add some extra code in the header. Then you can copy the header.php file of the parent theme, paste inside the child theme and make/add changes there and save the file. This header.php file will load instead of the header.php file of the parent theme. Hopefully, now you are able to create a child theme and make the customization that you like. Want to say something? Add it in the comments and I will get back to you. Enjoy! Wonderful blog about child theme. Easy and clear explanation that any newbie could get it. Keep it up. one question: to avoid index listing, should we copy the index.php to child theme’s directory? or should we create a blank new index.php? I could not understand what you mean by index listing. If you want to make some changes to index.php file then create a index.php file in the child theme folder, copy all the content of index.php file of the parent theme and you can make you changes there. Index.php file is a template file so the index.php file of the child theme will load of instead of index.php file of the parent theme. Also, I would like to add index.php file is the main file. There are many other files that will load for specific pages and if those specific files are not found then index.php file will load up as a fall back. You can get more info on what I am talking about in this link http://codex.wordpress.org/Template_Hierarchy. Can you please clarify: if I activated 2014 wordpress theme and added what the basic parent theme permits (such as a header, some sidebar images, facebook page plugins, footer images, some pages and some posts), if I update the 2014 theme which is currently requested, I will lose all this? Or are only customizations made beyond that allowed via 2014 options (such as had I modified 2014 to have the blog to be summary and not entire post…) lost? All the settings changes (options/settings provided by the theme itself like header images, sidebar widgets etc) that you make without touching the code and via the dashboard will still remain when you update the theme. Any changes made directly to the theme files code like index.php, header.php, style.css etc. will be lost when you update the theme. Hope this clears your query. Just want to say that Spacious is an excellent theme. Thanks for making it available. Now my question: How do I set up the theme so that files in a sub folder can be read. For example, there is an “inc” directory in the parent theme and I want to make changes to the functions.php file in that same directory I created in my child theme. Spacious is a very nice theme … thank you! Question: I copied the entire header.php into my spacious-child directory, put a Facebook code directly under the body tag (per FB instructions) and it works fine. But now I’m thinking that when the theme is updated, the header.php won’t be. Is there a way to put the FB code into the spacious-child functions.php? Hello, I have the same problem as benciscomusic, it seems that modifications made to the files in child themes inc-directory (header-functions.php for example) are not working. If I make the same changes to the parent theme, they will work in child theme also. But I dont want to mess that up. I just figured it. You need to copy functions.php from the parent theme to make the modifications to the subfolders to work in child theme (or just the functions which does the inclusion of the files in subfolder). I have used the (terrific) spacious theme to build a website with the slider widget on the front page, among other things. Now I would like to make some customizations in a child theme. I have followed the directions here exactly, to create the spacious-child directory and used the sample style.css and functions.php you provide (no modifications). I believe the site should look exactly the same as it does with the parent theme activated. However, when I activate spacious-child, the slider widget disappears from the home page, the site’s background color changes from blue to grey, and the site’s title and tagline are injected into the front page (bumping the logo over). I haven’t made any other changes. When I switch back to spacious (parent), the site is restored to its original glory. Are there other CSS files in the parent that I need to explicitly include? What the heck is missing? Thanks for using our theme and the feedback. About your question, the settings set of the child theme and the parent theme will be different. The main idea is to create the child theme first and then start working on the settings of the child theme. So, in this case you will have to redo the settings for the child theme as well. Hope this information helps. First off, great theme and GREAT support. I am happy I chose Spacious Pro. Now that my site is almost finished, I have learned about child themes. I have make a few changes, mostly in Custom CSS, but a couple in .php files. My question is this, if I create a child theme now, then upgrade the parent theme sometime later, will I lose the changes that are present currently in both themes? Same thing…that did not make any difference. I have added the ColorMag Pro child theme zip file to the list. You said that you added the ColorMag Pro child theme to “the list’ What list are you referring to? I cannot find it. do you have plans to make a child theme for Esteem pro? I uploaded and activated my child theme. (Downloaded ColorMag Pro from your list). The first thing I noticed is I had to set up all of my options again in the theme editor to get the layout back. (No big deal, that was pretty quick). The issue I have that I cannot solve on my own is that it is showing all of the content twice, when you scroll down the page to the bottom, everything repeats. Why is this? (It is not cative due to this so you will not be able to see it. Yes Lawrence. You will need to do the settings once again as the child theme acts as different theme. I checked the child theme and it looks all fine. I cannot think of anything that could do this. Are you seeing the widgets twice or anything else? You might want to check the widget area in dashboard, if you are seeing it twice then it might be that the widgets are added twice in dashboard. I have since deactivated the child theme. The slider area and right of the slider only work if I add them on the main theme….the widgets for right and left content show up twice….The child them for my site simply does not agree. It surely is not as straight forward as explained above. Also…The content top section widget shows up on the child theme however when I expand this box in the customization ox there is nothing there n either the parent theme or the child theme. Front Page: Content top section widget in both the main theme and child theme is empty, but shen I activate the child theme, it shows the Latest post in this area. I checked both themes and there is no widget in Front Page: Content top section. Where is this coming from? Here is an interesting thing…..I have just deleted all widgets from both themes and when I activate the child theme all widgets still show up on the webpage.??? That seems to be strange. I have tested this in my local setup and everything is okay as it should be. Try switching to other default theme. Reinstall fresh copy of the theme of ColorMag Pro and ColorMag Pro child. See if this fixes it by any chance. Also, try hard refreshing the browser and confirm it is not the caching issue. hello, I’ve more than 7 days in the problem about make wordpress site in two language, so after I make child theme for arabic content like header and footer and the parent theme will use for English content like header and footer so my problem how to link or connect index.php English with index.php Arabic from the button in header for those ? I am sorry I could not get exactly what you are trying to say. But reading your question, I see that you are trying to have your site in two language (multilingual site). May be you can try this plugin https://wordpress.org/plugins/polylang/. Sorry for the late response on this topic. I have done exactly what you asked in yout last post. I changed to another theme. Deleter ColorMag Pro and child theme completely. Flushed my cach, then re uploaded both ColorMag Pro and child themes. The results are exactly the same as what I stated. See the copy below of my issue. I really hope you and your team can resolve this issue quickly for me, not only do I need this child theme to work for some minor edit I would like to make, but I have emailed your tem in regards to creating a new page theme for me that I have agreed to pay $200 dollars for that they tell me requires a child theme first. Until we resolve this issue I cannot proceed. I wish I could include a picture of my page with the child theme active so you can see whats happening. “Here is an example of what is happening. Please send your temporary username and password via our contact page http://themegrill.com/contact/ (NOT HERE). I will look into it. I am not able to recreate the issue in my testing environment, so I will have to test in your site. Sanjip, I have been waiting for a response to for several days. You asked me to send my temporary username and password, but you never explained to me what you mean by this. How do I send it to you and where do I get a user name and password for you??? Please respond soon. This issue has been going on for a long time and if I cannot resolve it I fear I will have to give up this them e completely for one that gives me quick support. I paid for the theme, so please help. Hi Lawrence, I have replied you, please check the mail. As it was weekend there was delay. Ive checked my email…there is nothing from you regarding this. Looks like there was some error with our hosting and email sorry. Sorry, for the inconvenience. Please check now. Sinjap, I do appreciate that you have gotten back to me on this, however I have chosen another theme for my website. Very similar to color-mag pro in looks, but it has all of the features I wanted from theme-grill without having to pay for the extra page template, and the child theme worked perfect right away. Its unfortunate that I had to give up on your theme, but there were just too many issues and it takes too long to get them resolved. Thanks again…good day. Do you have a child theme zip file for Ample? I have added the Ample child theme zip file to the list in the above post. You can download it. Also, I have used the new best method to create this child theme. I will soon be updating the post with new best practice. Thanks. Great post! Can you make a Child theme from another Child theme? Basically, I want to customize a template I bought but the template is already a Child theme of a Parent Theme. I want to make a “Grandchild theme” that inherits from both the Child theme and the Parent them that I can further customize. I tried it and was unable to get it to work, I may be doing something wrong however. Thank you! I think it is not possible to create the grand child theme same as the child theme. I tried it myself and looks like ti cannot be done. Even if can be done, the core developers have mentioned this is not a desirable behavior. You will run into many issues. However, I understand that sometime it may be needed. I found this article https://docs.appthemes.com/tutorials/creating-grandchild-themes/, may be this will help you. Also, if you have bought the child theme, you can put your query to the theme author/support. They might be able to show you the best way. Which way should I use now? For now both the ways will work fine. However, we should move on with best practice as the older practice might give some error in future point of time. So, if you are comfortable with new method you should use the new one. Also, I will be updating this article soon with the new method and also update the child theme zip files. Currently, I am working with release of new free and pro themes. Once it is done, I will update this article. Thanks. When we changed the child theme option of parent theme doesn’t effect in child theme. ( i.e when i hide some section in parent theme but show in child theme ). There is any way to get all theme option of parent in child? Your instructions are great. I have a question: I want to insert the Google Analytics code as a script in my spacious child theme. Do I have to do this include the complete parent header.php or which parts of it? Yes, if you are looking for to add the script in header. You can create header.php file in you child theme. Copy the code same as of parent. And then add you script in header.php of your child theme. Also, if you don’t want to do this hassle you can just use a plugin. You can try this plugin https://wordpress.org/plugins/google-analytics-for-wordpress/ or any plugin that allows to add script in header or footer area. Hope this helps. Applies for the same as for the header.php or is it sufficient if I enter only the custumer code into the new file? maybe my question is too stupid to get a response. I just wanted to know if I ever need to copy in the Childtheme the entire file contents of the parent theme. In my child theme, I had modified header.php, but after parent theme upgrade, found that my site broke. I found that header.php used to call a function ‘of_get_option’ in the old version of theme whereas the new version uses (an almost identical function) called ‘spacious_options’ – simply replacing all instamces of ‘of_get_option’ with ‘spacious_options’ in chlld theme’s header.php, solved the problem. I notice that what bugs me the whole saying my template is missing? Its only in the template. It must have all small letters. I did the wrong ColorMag. The correct should have been colormag. After watching a lot of Youtube videos I chose Spacious Theme vs Vantage, etc. I have installed it in a Wamp64 local server for my trial website. Unfortunately, I customized Spacious first instead of Spacious Child theme. health-cures-s25.jpg An error occurred in the upload. This can sometime be due to plugin conflicts. So, try deactivating your active plugins one by one and see if this solves the issue. Thank you for your suggestion, Sanjip. I started from scratch and re-installed Wampserver and WP, so far so good. Could you help me again with removing Post Author and Date? I couldn’t find which php file or Dashboard section to make the modification I need. HELLO WHAT OF COLORMAGFREE THE CHILD THEME? Sanjip, I can’t for the life of me get the Spacious Child theme to work. I am absolutely NOT a programmer, which is probably why I’m having such problems, but I’ve read that @import no longer works all the time and something about enqueue instead? I’ve tried to make my own with enqueue but without success. It is so cool that you’ve provided all these children above. Is there any way you could make a Spacious Child with that enqueue function? This is driving me crazy! I have already modified my theme before realised i need to create a child theme. How do i go about it? And i noticed you have given us the child theme zip file. In this case, you will need to redo the changes, this time via a child theme. Either you do it again via child theme or you will have to stick with current modified theme without updating in future which I personally don’t recommend as you will be missing the bug fixes, new features, WordPress latest version compatibility enhancement that comes with version updates. So, if you are able you will need to redo those via child themes, else you will have to hire professional to make the child theme. I am using flash theme. I have created a child theme but the customizing options are not dispalying. Any solution??? Sorry for the inconvenience. We have now updated this article with Child theme file for Flash theme as well. Please download the Flash Child Theme ZIP and customize. I think there will be no problem now. For the Spacious child theme, I lost the ability to customize the logo under the Site Identity section. I can attach a logo, but it does not appear on the page. Sorry for the inconvenience. May I ask you to submit your query in the support forum? Besides, we do have live chat support as well. Hi Scott, I have the same issue. Did you get a fix for it? I made a flash child theme and now the social menu won’t appear. How do I fix it? I am trying to create a child for Flash Pro. I started with the flash child zip as there isn’t a Flash Pro version but tweaking the details in the child style.css I am still seeing an error message ‘The parent theme is missing. Please install the “Flash Pro” parent theme.” .. any suggestions? Please contact our support team here: https://themegrill.com/support/. Why don’t you provide a child theme in .zip format so that we can just download it right away? Thanks for dropping your comment. If you are looking for child theme zip for any of ThemeGrill themes, then we have added those in the list. If we have missed any then please let us know and we will add it as well. Now, if you are just referring to a general child theme, then what you can do is just download any of our child theme zip file from above say Flash child theme zip file. Then you can just edit the details with your own details to make the child theme according to your requirements. HI, This post appears to be a good post. I have a basic managed wordpress hosting via godaddy. All I have access to is the wordpress admin. There is nothing in the WP admin that allows me to access the theme folder . How can i access the theme folder to create the child theme? Please contact your hosting company’s support team for this issue. This is prabhu. I’m a web developer. i love working with wordpress. your article about how to create wordpress childtheme will be really helpful for the beginners. your article is very simple and neat. its easy to understand. I have already started building my website, will this affect my ability to make a child theme? We have just updated the post with Flash Pro child theme. Please check it. I need help ..Can you please help me??? Sure. Please contact our support team. I just downloaded the files to create a Flash child theme, but when I activate the child theme, the logo, the social menu and the principal image do not appear in the child theme. Thanks in advance and best regards!!! If I put it on the “Additional CSS” section of the Customizer it works, but I would like to have in the file instead of the Customizer. So glad we could help you. That way our support team can provide you with the solutions in a more convenient way. Thank you! I have the Cenote team, the free version and I would love to edit the footer part “All Right Reserved. Theme By ThemeGrill. Proudly powered by WordPress”. I would like to remove the powered by WordPress bit. Is there anyway I could do that without changing the theme to a Child Theme? Glad to hear that you are using the theme Cenote. However, the free version does not provide the option to remove the Powered By text. The option will be available on the premium version. We are currently working on it and it will soon be available. The CSS Header text on eStore child theme is not showing awesome fonts icons. 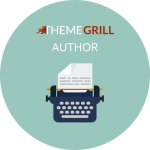 You can put your queries about our themes on the ThemeGrill Support Page.